This week's image of the week (1 October 2015) is of Hale Crater on Mars showing large, dark, narrow streaks believed to be caused by seasonal flow of water. 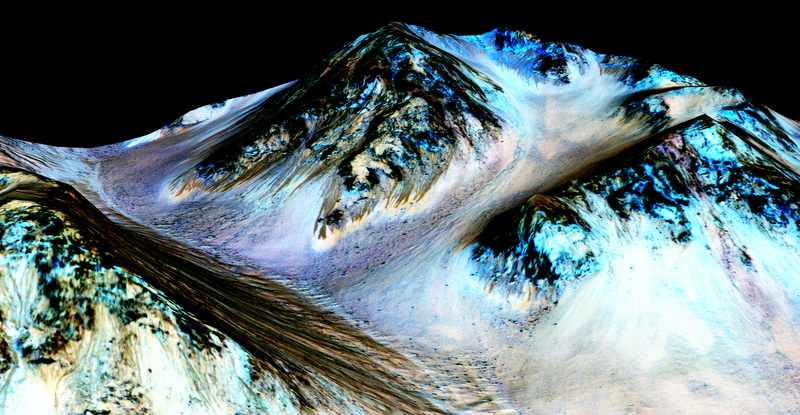 According to recent evidence, the summer months on Mars cause liquid water to run down crater walls raising the chance of there being life on the Red Planet. The source of the water is not yet clear, however some theories suggest it comes from underground or out of the thin atmosphere. The above image from NASA's Mars Reconnaissance Orbiter was produced by creating a 3D digital terrain map of the area based on information from two High Resolution Imaging Science Experiment (HiRISE) observations. The European Space Agency (ESA) has two missions falling under the Aurora programme which will help develop technologies that will lay the foundations for human exploration beyond low Earth orbit. The two missions (ExoMars 2016 and ExoMars 2018) are joint missions between ESA and the Russian Space Agency (Roscosmos). The main aims of ExoMars are to examine the geological environment on Mars and search for evidence of environments that may have once, and perhaps could still, support life. The 2016 mission includes a Trace Gas Orbiter (TGO) and an Entry Descent and Landing Demonstrator Module (EDM).The instruments will detect and study atmospheric trace gases such as methane. The EDM will contain sensors to evaluate the lander’s performance as it descends, and additional sensors to study the environment at the landing site. On arrival of the rover in 2019, the orbiter will relay data from the rover back to Earth. Airbus Defense and Space is the lead builder of the ExoMars rover and SCISYS UK Ltd has been supporting the development of the rover on-board software and its autonomous operations. There is considerable UK involvement from a number of academic institutions with the on-board rover instruments. What did you think of the latest discovery? Do you believe there's life on Mars? Tweet us or tell us via Facebook.